The most powerful and comprehensive spell-checking software for ANY Windows applications. 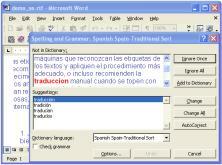 ORFO - SPELLINK Spanish supports English and Spanish languages. This software exceeds the power of widely available spell-checkers by its new unsurpassed capabilities and choice of languages. It comes with a comprehensive 300,000 words American English Dictionary, including most current terms related to various technical, business, medical, humanities and scientific domains. Spell-check text in any application installed in your system. Integrate directly into existing spell-checkers in most applications such as MS Word 97/2000/XP/2003/2007, MS FrontPage 2000/XP/2003, MS Publisher XP/2003/2007, MS Works 4.x, MS Access 97/2000/XP/2003/2007, MS Excel 97/2000/XP/2003/2007, MS PowerPoint 97/2000/XP/2003/2007, MS InfoPath 2003/2007, MS Outlook 97/98/2000/XP/2003/2007, MS Outlook Express 5.x/6.x, MS Internet Explorer 6.x, Mozilla FireFox 2.x, Opera 9.x Lotus WordPro 97/2000, Corel WordPerfect 8.0/9.0, Adobe PageMaker 6.x/7.0, QuarkXPress 4.x/5.x. Add new words in all forms in accordance with the morphological rules of the supported languages. Check the spelling in Windows applications without the spell-checking function in Standalone Speller and via the hotkeys. Change language on-the-fly while checking spelling in a multilingual document. English language spelling module includes additional specialized dictionaries, such as Business, Science, Humanities, Medical and Technical. Spanish language spelling module includes additional specialized dictionary of of Medical Terms.